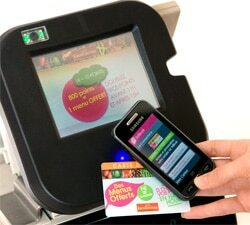 Three retailers in Nice are using Fidbook, an NFC loyalty application that works with a simple reader costing under €100 and avoids the need to upgrade to a contactless payments terminal. 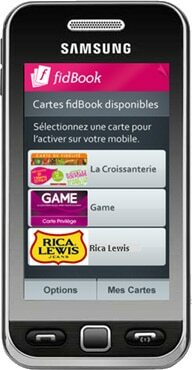 Branches of fast food chain La Croissanterie, jeans specialist Rica Lewis and video games retailer Game in Nice have introduced NFC-based loyalty services using Fidbook, a loyalty application for NFC phones which has been developed by contactless marketing services specialist Airtag. The advantage for retailers, it is hoped, is that this will then encourage consumers to sign up for far more loyalty programmes than they would previously have done, enabling even small retailers to gain a better picture of their customers’ shopping habits. Airtag offers three different ways for consumers and retail staff to interact with the Fidbook application in stores — via smart posters, Airtag Pad interactive displays and simple NFC readers which attach to retailers’ existing electronic point-of-sale equipment. The Airtag ‘Smart Reader’ NFC readers are particularly interesting because they involve a different approach to the question of how to enable retailers to add NFC support in-store. The usual idea is that, because NFC is compatible with contactless payments terminals, retailers will integrate their loyalty and promotional programmes into these POS devices — thus providing stores with a reason to also switch to accepting contactless payments. But Airtag CEO Jérémie Leroyer has told NFC World he has found that this isn’t actually an approach that meets most retailers’ needs. Airtag does offer the option of integrating NFC read/write functionality into a contactless payments terminal, but feedback from tier one and tier two retailers — those with between ten and hundreds of stores — has shown him that this isn’t their preferred route. Current generation barcode-based loyalty cards connect directly to the retailer’s customer database via a barcode reader attached to the store’s cash registers. This allows the retailer to automatically update the database with the new transaction data and to provide information such as an up-to-date points balance or eligibility for other rewards on the cash register’s display or on the receipt. When a customer chooses to redeem loyalty points, a new total for the transaction value is calculated and the value is then sent to the POS terminal for the payment to be processed. While this process could save space and money if combined with a contactless POS terminal, Leroyer says that his experience has shown that retailers prefer to keep their loyalty programmes separate from their payments processing. Airtag’s Smart Reader, therefore, plugs into the back of a retailer’s cash register alongside their existing barcode reader and connects directly to the retailer’s database without any changes to the back office software being needed. Fidbook, therefore, doesn’t replace a retailer’s existing loyalty programme. Instead, it just makes it easy for retailers to offer an NFC version of the cards they currently use to identify members of their loyalty programme at the point-of-sale. And, with the readers costing only €100 in low volumes and as little as €50 in large volumes, Fidbook can provide retailers with a very low-impact way of adding near field communication functionality to their loyalty programmes. The readers are also able to interact with a wide range of other contactless devices, provided they use one of the card formats supported by NFC standards. So retailers can issue contactless cards to customers who don’t have NFC phones and, in Paris, consumers are using their Navigo contactless transit pass to identify themselves at branches of La Croissanterie. This eliminates the cost of issuing a loyalty card to every customer. For customers with an NFC phone, the readers also provide a quick and easy way to sign up for a retailer’s loyalty programme. When a customer touches their Fidbook-equipped phone to the reader, if they haven’t already signed up for the programme, they receive a prompt asking them if they would like to sign up now. They then simply select the ‘yes’ option and the retailer’s loyalty application is automatically added to the phone’s Fidbook. In Nice, smart posters have so far only been installed in one store, where they are being used to enable customers to sign up for the merchant’s loyalty programme by simply touching their phone to an NFC tag embedded in the poster. Airtag is now investigating a range of ways to also use the smart posters to offer coupons and other types of special offers with a view to testing this functionality in the near future. Airtag Pad interactive displays, meanwhile, are designed to be used by both staff and customers. The devices feature a 5.7 inch touchscreen display as well as an NFC interface and other connectivity options and can be used to enable customers to access a range of multimedia information services. As well as the Fidbook application, Airtag also develops and manages full NFC and contactless loyalty programmes for retailers and has also developed an NFC portal application. This acts as a single point of access to all the NFC applications on a customer’s NFC phone, including transport and payments applications as well as Fidbook, and is offered by NRJ Mobile to all its Cityzi customers in Nice.